Lei Day, officially launched in 1928, is a popular festival in Hawai`i. Don Blanding, then a columnist for the Honolulu Star-Bulletin, came up with the idea, later saying that at the time Hawai`i had no day that was special. Why not have a Lei Day – a day when everyone could wear lei and give lei? Grace Tower Warren, another columnist, suggested May 1st would be the perfect day. 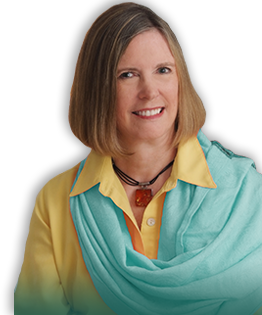 Coincidentally, she came up with the slogan: May Day is Lei Day in Hawai`i. Leonard Hawk wrote a song for the new holiday, one that perpetuates the theme. “May Day is Lei Day in Hawaii” was written as a foxtrot, though now the music is adapted to hula. You can sing along with King Nawahi’s Hawaiians. 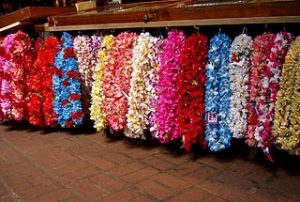 The City and County of Honolulu holds an Annual Lei Day Celebration at Kapi`olani Park to celebrate lei and the artistry of Hawai`i’s lei makers. This year’s theme is Lei `Aloha Kea – The brilliant white lei, the platinum of kupuna. Charlene Leimomi Irvine is the 90th Lei Queen. She has two princesses in her Court: First Princess Helen Mealoha Yuk Jun Kuoha-Torco and Princess Sharon Rose Marie Au-Curtis. Free lei-making workshops have been held throughout O`ahu with participants encouraged to enter the Lei Competition on Lei Day. Lei Day is a joyful event. A time to relax with friends and share aloha. When a lei is made, the mana of the creator is woven into the flowers. Thus, when you give lei, you give a part of yourself. When you receive lei, you receive part of the person who created it. Princess Helen Kawananākoa quoted in Leilehua Yuen. 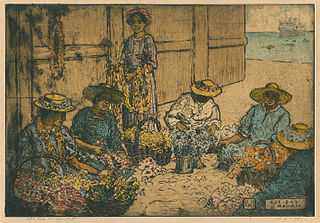 “May Day is Lei Day in Hawai`i.” Ke Ola. May-June 2016. Quotations from the Honolulu Star-Bulletin taken from “May Day is Lei Day in Hawaii.” Perfect Days Hawaii. Leis by Janine. Creative Commons Attribution. Princess Abigail Helen Kawanākoa. Public Domain. Lei Day Hawaii by Charles W. Bartett. Hand Colored Etching. Public Domain. 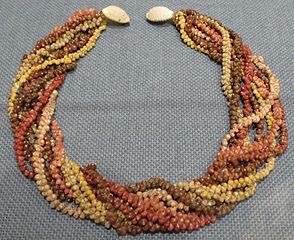 Eight strand Lei Niihau, Bishop Museum. By Heart. Creative Commons Attribution. 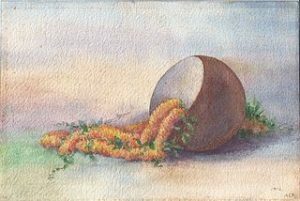 Still Life with Ilima Lei and Coconut by Helen Whitney Kelley. Watercolor. Public Domain. Lei Day Celebration. City and County of Honolulu. Cara Fasone. May Day in Hawaii. Hawaiian Culture Stories. Marie Tutko. May Day is Lei Day in Hawaii. Kings Hawaiian. April 29, 2013. Nina Wu. “Honolulu’s 90th Lei Queen and Court Crowned.” Honolulu Star-Advertiser. Mar. 5, 2018.